Join over 350 studios on the Legends of Learning Platform! Welcome to Legends of Learning! We have over 1000 educational Science games on our platform and now we are building 500 new educational Math games. Come join the sprint and get paid for building a great game! It is easy: We’ll give you the concepts you need to teach inside your game, and you decide how to make the best game to teach them. Know how to teach “Adding Fractions” with a side-scroller? Great! Think you can make an awesome tower defense game to teach “Multiplication by 10”? Go for it! Whether you are an independent studio that can make one game during our three month sprint, or a 100-person company that can deliver 50 games in that time, we want to work with you! We pay for each game, including an up-front fee upon contract signing. We’ve worked with 350 studios already – so check out what they have to say in the testimonials below. We’ve paid out nearly $4 million to game developers on our platform. Curious what kind of games we are looking for? Create a free teacher account on our platform and explore some of the top-rated games. Come join us to revolutionize how kids learn! Legends of Learning (LoL) gave us an opportunity to try different ways to re-learn & teach about concepts we study long time ago and we had a lot of trouble with, although not because the concept is boring but because the way we were learning them years ago was getting old and it needed to be updated. That's why LoL has been a terrific experience for us, we feel like we are doing our part to change that old way the education system works and we are helping to update it with more didactic resources like videogames, the sum of all mediums made interactive! My name is Jameson Wilkins, I've contracted as a games developer for Legends of Learning since December of 2016 and built 5 different games for the science modules. Legends of Learning is a great company to work for. As a developer, you are empowered to make the games you want to make. You choose the subject matter and have full creative control over the project. Legends of Learning provides you with the documentation and educational materials to inform you on the subject matter, and includes clear requirements for necessary topics and technical needs. Teacher reviews give you the feedback necessary to polish your games, and the payout system is very fair and transparent. I plan to continue developing games for Legends of Learning as long as possible! My name is Lydia Kovalenko, I am the owner of LKMAD.I must admit that when I first heard about this opportunity I was skeptical, because it seemed too good to be true. My concerns however were completely unfounded, and I had a great time producing a game for Vadim. We were not constricted in any way in terms of creative direction. We were allowed to experiment and come up with new ways of teaching a topic of our choosing. We were compensated very fairly and without any delay or problems. The entire process was very relaxed and Vadim was always available to help with any questions or concerns that we had. I enjoyed creating the game so much that I recently signed on for two more and I'm excited for the work ahead. The best part about this, is that what we create will help shape young minds and take education in a whole new direction where learning is done through active rather than passive activities! 1000+ games from 350+ studios! 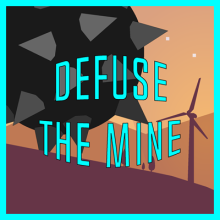 Check out a top grossing game, Defuse the Mine, earning over $18,000 to date! Ready to sign up? Fill out the form below and we’ll invite you into the sprint!